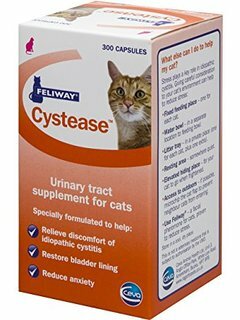 Feliway Cystease (previously Cystease S / Cystease Advanced) is a tablet given to cats to help encourage urinary health. As stress is considered the main factor in urinary health, it is recommended to use alongside the Feliway calm-inducing diffusers which are available from VioVet here . Various factors have been recognised as being associated with the urinary problems, such as obesity, dried biscuit diets and stress due to environmental factors (often from other cats). Feliway Cystease also contains Hyaluronic Acid and L-tryptophan. Hyaluronic Acid provides further help to the lining of the bladder wall, whereas L-tryptophan has a calming and de-stressing effect on cats generally. The results are even better if Cystease is combined with the pheromone calming effect of a Feliway Diffuser which can be bought separately and used at the same time. Cystease tablets should be given once or twice daily to an average sized cat. Once the problem has been brought successfully under control, it is often possible to reduce to a lower rate. This can be increased again if a stressful period or event is anticipated. Cats prone to this type of bladder problem do better if they have a higher fluid intake, which helps produce more dilute urine. The problem is very unusual in cats which are not producing concentrated urine. Therefore we would recommend that most of the diet consists of wet, not dry food. Obese cats are more prone to trouble too, so the total amount of food provided should be restricted so as to keep the cat's bodyweight to the ideal level. Capsules may be given whole or broken open and mixed with food. Below are some recent questions we've received regarding Feliway Cystease, including answers from our team. I have a 6 yr old male neutered domestic cat who since april has been to vets numerous times. Each time bladder is empty and get given metacam. Will these tablets help him at all? These tablets are indeed intended for cats exactly like yours. "Idiopathic cystitis" is one of the names used to describe the condition and it certainly seems to help using a product like this. It has to be given for a few weeks before it is fully effective, then has to be given long-term. My guess is that your cat is predominantly on dried food. It is not always the case, but most cats with this problem are on dried food. If this is the case, you have the option of stopping almost all the dried food and giving wet only (tins, pouches etc). Cats virtually never get this type of cystitis if they are producing dilute urine and many cats on dried food just produce concentrated urine instead of drinking more water. A very moist food will largely eliminate this effect. It also encourages cats to drink if you leave 1 or 2 drinking bowls (glass or ceramic ideally) on windowsills or other places where your cat tends to go (away from the feeding area). This will help and might be enough to stop him from getting the problem again. My cat is currently on a renal diet as she has kidney disease. Is it ok to use this alongside as she has always suffered with bouts of cystitis? This product is safe to use in the presence of reduced kidney function. 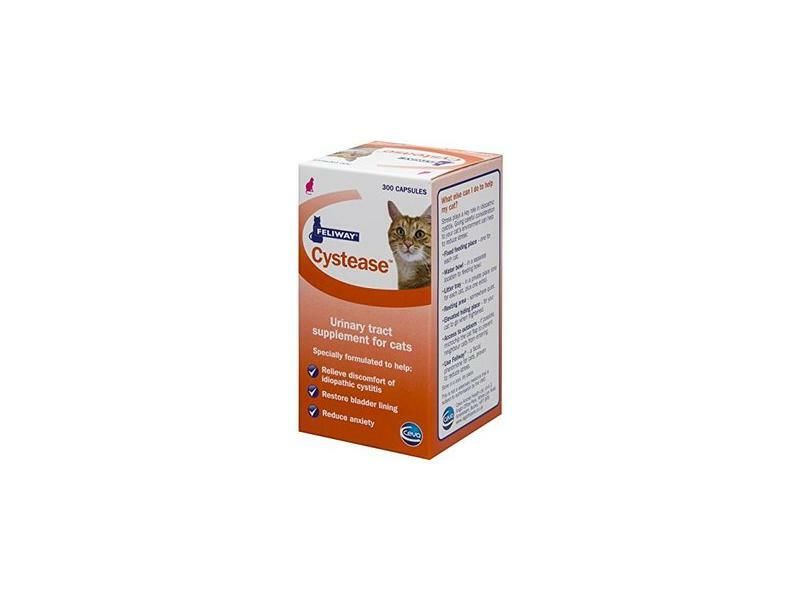 I would say though that it is intended for "Idiopathic cystitis" which is the commonest cause of cystitis in younger cats, but tends not to happen as much in older cats. (Cats with reduced kidney function tend to produce larger volumes of dilute urine and this seems to protect against the usual type of idiopathic cystitis.) If cystitis does occur in a cat such as yours now, it is more likely to be a bacterial cystitis which Cystease is not intended for. You can certainly use Cystease but if you see the symptoms of cystitis, it would certainly be worth having your vet check her over. Product Availability + Expiration Date ? Please is it possible to know when (Flyway Cystease 300 Capsules ) will be available and when will be the expired date ?... Thanks and I hope I hear from you soon . These should be available in the next 2-3 weeks, and the expiry date should be close to 2 years. Hi my cat is a ragdoll vet just diagnosed with asthma anyone else have this problem and if so any recommendations ? Feline asthma is diagnosed sometimes. It varies enormously in how badly it affects any particular individual, from a mild, intermittent cough to serious and sudden difficulty breathing. Treatments are similar in many ways to those given to people with asthma and often involve steroids. On occasions antibiotics are given too if it is felt that secondary infection of the airways is involved, though this is not usual. Your vet is the best person to advise you what to do. Do the tablets cause thirst as my 17 yr old since taking them seems to be thirstier and a bit off her normal food? Increased thirst is not normally noticed with this product, but this is a symptom which should be checked by your vet. The condition of idiopathic cystitis which Cystease is normally used for, is not common in 17 year old cats (they more commonly get septic cystitis which might need antibiotics). I would suggest that you see your vet. Combining products good or bad? My cat has recurrent urinary tract problems, which I believe is a combination of stress and her urine being too alkaline. She is a very jumpy cat and recently a dog has been introduced, which I think she has found stressful also. I know her ph is very alkaline as I have combur9 test strips which show very green - which indicates her urine ph is 8 or 9. I have bought these cytease tablets, as well as the M&C urinary tract care paste - and I wanted to check they're suitable to combine. I was planning to give her the paste in the morning and the tablets in the evening - as I understand the paste will help lower her urine ph and the tablets will help calm her, and restore her bladder lining.... I'd be really grateful if you can you advise if that's correct and that combing the two would be safe please? Also - I am slightly confused as to why her ph is so alkaline - she eats very high quality, high meat (min 40%) content wet food twice a day, as well as grain-free, high protein biscuits.... my understanding is that it's biscuit only diets, or diets with too many carbs (grains) that tend to cause high alkalinity.... she drinks water from my water filter - could this be causing alkalinity? Or are some cats just prone to over-alkaline urine....? The pH of urine can change significantly after it has been collected, especially if it goes into a litter tray. Some test strips are not very accurate on feline urine too I suspect. Therefore firstly I am unsure if your cat is genuinely producing such alkaline urine. If this is a genuine result and the diet is as you say, then I would suspect a urinary infection or metabolic disturbance. Ideally these things should be investigated before starting treatment. The treatments you have mentioned would be safe to use as you intend and can be helpful for idiopathic, aseptic cystitis. They might not be effective depending partly on the nature of any underlying problem. If your vete is sure this is idiopathic cystitis then the products should be OK to use together. Otherwise, you should try to get a good diagnosis and understanding of what is going on in your cat. It might be time to see the vet! I hope your cat gets better soon, cystitis can be quite distressing for cats. Can Feliway Cystease be given to a pregnant cat? 2 weeks ago my cat had a bladder stone removed, and is now on Cystease tablets (2 a day). I am on holiday for a 9 days soon, and although I have people coming in to feed both my cats, I don't think that they will be able to get the cat to take the tablets. Leaving them down in the food might work, but the other cat might just eat them. How much harm is it likely to do if the cat does not in fact eat any of the tablets for 9 days or so? There will be Urinary Tract Health food down for them to eat all week. Cystease tablets have a gradual effect which builds up over time. I expect that it will not be a disaster to miss them for 9 days, but some of the protective effect on the bladder lining will be lost. It will build up again once the tablets are resumed. Ideally you would not miss the medication for this period, but it is unlikely to cause any trouble if you cannot avoid it. It says that these pills help for stress. Do I still need to give something such as zylkene alongside it or will this suffice as a treatment? The stress I mean here is some disruption due to moving. This product contains an ingredient (L-tryptophan) which is believed to have a calming effect. Anything else which also has a calming influence could help as well and Zylkene is probably better at achieving this effect anyway. I would continue with the Cystease all the time, but add Zylkene for a few days either side of the move. Both products are very safe and the calmer you can keep your cat over the move, the better things are likely to be. My cat is currently on cystaid plus after suffering a blocked bladder. I'm considering switching to cystease. I've been told both do the same thing and can be used long term but how long is it safe to continue using cytease for exactly? All products of this type are intended to be given for extended periods, possibly for life. It is certainly considered important for them to be given for a good number of weeks as they take a while to build up on the bladder and to become effective. If the cystitis appears to have been triggered by some other factor, then tending to this effectively might mean that the Cystease is no longer needed. Indeed switching from dried to wet food and hence increasing the cat's water consumption can be a helpful treatment in itself. Essentially Cystease should be given for at least a few weeks, but it is often given safely for years.